Manual administration processes open up DSP’s to the risk of unidentified errors, or errors that are identified but take extra time to fix. This may not seem like a big deal, however do you know how much these errors are actually costing your business? Lost time in identifying and fixing the errors. Lost money in paying out more than you need to for employee expense claims. Major cash-flow implications from incorrect invoice claims denied by NDIS causing delays in payments. 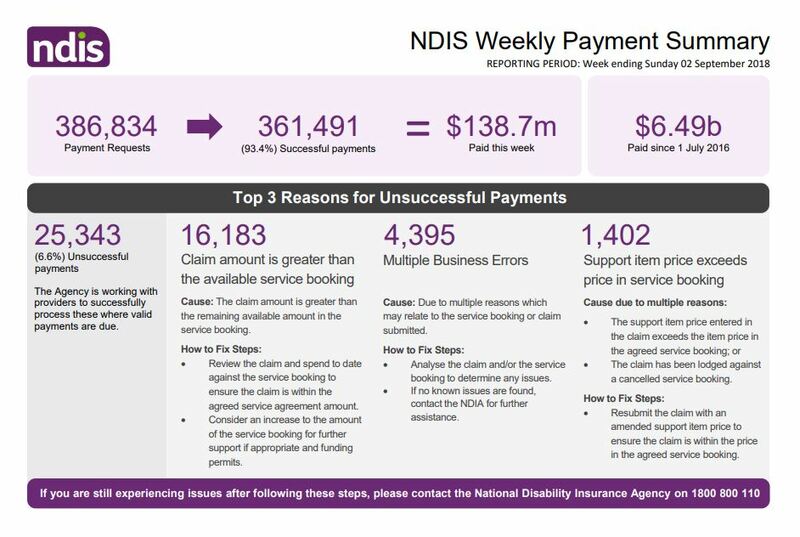 Review of the recent Weekly Payment Summary from NDIS shows that of all of the payments that NDIA has processed since July 2016, a large number of payment claims are unsuccessful, being sent back to the DSP for review. The claim amount is greater than the remaining available amount in the service booking. This means that your DSP has delivered services over and above the amount that is left to be provided for. This is a big deal, and one that can have a huge flow-on effect cash-flow wise. Time and wages would have been used to deliver these services, that you may not be able to claim reimbursement for. Having manual administration processes makes it difficult to pin-point these errors after the fact, let alone making it near on impossible to flag BEFORE they happen. If there is conflicting information on your service claim, NDIA will reject the payment and push it back to you to rectify. For businesses with manual administration processes, this can result in lost time, productivity and wages in trying to locate and correct the errors. Support item price entered in the claim exceeds the item price in the agreed service booking. With the sheer volume of line items and claims being required under the unit-funded, client driven funding model, can make manually investigating and correcting an error in item price matching, very time consuming and morale destroying. Implementation of dedicated software to streamline processes and minimise manual administration handling, is a proven way to increase productivity and accuracy of financial data within your business. CARETAG, is a specially developed, software management system, that integrates NDIS data, client care plans, service delivery activities, rostering and resource management, and invoice generation in one, intelligent system. CARETAG is a modular-based system, that cross-matches data from one information bucket to the next, ensuring the financial position and service provisions match up with the care plans and allocated funding. Integration with NDIS’ item codes allows for easy invoice generation, while automatic deduction of service costs against the overall client approved service budget, ensures that services cannot be inadvertently delivered after the client’s approved funding level has been consumed. If you are struggling with high overheads and time-consuming manual administration processes, contact us today to discuss how CARETAG can save your business time and money.